Living so close to a desert, I have learned to not place expensive potted plants out front of my home, where they can be feasted upon by javelinas. One morning while I was outside watering my plants, I noticed that a few of them had been torn to shreds and completely ruined. What had happened? The next week, I planted a few more and placed a video camera outside all night long. When I went to check the plants the following morning, they were gone, again! I watched the video footage and found out that a family of javelinas had thought that they had found a free feast! Who knew that javelinas could be such curious creatures? One evening, one of my cats was sleeping in the windowsill, which is very low to the ground. I was watching TV, but then I heard a small bump against the window. I figured it was just my cat, but it convinced me to look over. There was something outside the window! At that very moment, my cat had woken up and what was the first thing he saw? 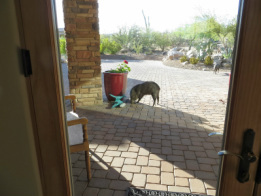 A javelina just on the other side of the glass! The javelina's curiosity did not kill the cat, but it did, however, scare the living daylights out of him! To this day, my cat still refuses to sleep in the windowsill at night.